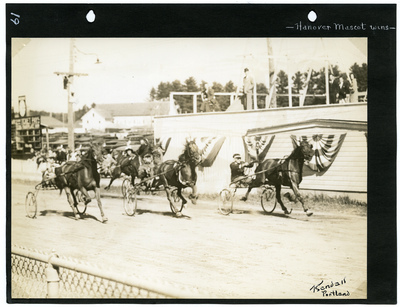 Sepia tone action photograph of bay gelding, Hanover Mascott, Haddock up winning the first heat of the 2.14 Trot on Friday, September 16, 1938 at the Oxford County Agricultural Society in South Paris, Maine. Chestnut gelding, Calumet Euclid, Chappelle up finished the race in second place. Chestnut stallion, Calumet Evart, Day up, claimed third. The field was rounded out by bay mare Aura, Carpenter up, crossing the line in fourth and bay gelding, Calumet Calling, Hanafin up showing in fifth. The photograph is signed in the lower right corner by photographer Guy Kendall.